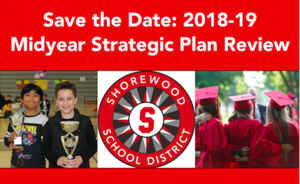 Parents, guardians, and community members are invited to attend the Shorewood School District's mid-year review of the 2018-19 Strategic Plan on Wednesday, February 20, from 6:30-8:00 pm in the Shorewood High School Library (on the second floor of the High School Administration Building). Shorewood School District administrators will discuss the work that has been completed and the remaining work that needs to be done in the five different categories of the Strategic Plan: Academic Mastery, Character and Citizenship, Wellness, Diversity, and Facilities. School Board members will also be available to discuss the upcoming April 2 facilities referendum.